Audiences know exactly what they’re getting into when they buy a ticket to director Jon Turteltaub’s THE MEG. And, blessedly, the action-adventure delivers on that promise to thrill, entertain and engage the viewer in the best ways a Summer event movie can. This one, based on author Steve Alten’s best-selling novel, exceeds expectations. It’s JURASSIC PARK and JAWS on steroids. A perfect blend of silly and serious, this gargantuan mega-dose of action-driven spectacle is an absolute must see with your chums. Expert deep sea diver and Naval Captain Jonas Taylor (Jason Statham) has previously tussled with a mythical giant prehistoric shark – the Megalodon – on a prematurely aborted rescue mission deep in the Mariana Trench. This tragic incident cost him his job, marriage, and reputation since no one believed him about what he saw. Not only that, it also took a huge bite out of his self-confidence. But five years and Lord knows how many beer bottles later, Jonas gets the call to action again. A private research station has lost track of a vessel carrying Jonas’ ex-wife Lori (Jessica McNamee) and her team (Masi Oka and Ólafur Darri Ólafsson), and they’re the new subjects of the Meg’s terrifying advances. However, during this redemptive rescue, they unknowingly unleash the sea beast long held captive – and she’s hungry and headed towards the densely populated shore. Surprisingly, feminism is represented rather well. Jonas meets his match with station biologist/ single mom Suyin (Bingbing Li). She’s just as strong-willed, hard-headed and smart as Jonas, even if her hero moments are mostly about saving her family – daughter Mae (Shuya Sophia Cai) and dad Dr. Zhang (Winston Chao). Their repartee is decent, but more importantly it provides a surprising (albeit brief) “female gaze,” as the camera lingers on Statham’s bare chest. Engineer Jaxx (Ruby Rose, who admittedly should be carrying an action movie franchise on her own by now) is also given minor moments of fortitude and intelligence to shine in a supporting role. Jason Statham battles the Meg in THE MEG. Courtesy of Warner Brothers Pictures. But perhaps what works best about THE MEG is how it brilliantly handles tone. Turteltaub, along with screenwriters Dean Georgaris and Jon and Eric Hoeber, nail it time and time again. The film knows what it is and doesn’t over or undersell its goods. The filmmakers find a healthy balance within each of the big, mega-intense action set pieces that alternate between the plausible and preposterous elements. They walk that line with precision, not unlike how the FAST AND FURIOUS series monitors its bombast. The escalating situations function at maximum pressing urgency. Similar to Alten’s books, it mixes fiction and fact with ease, creating a product that engages the audience. Despite the hard and fast rules of logic not being of much value, it plunges audiences into a world where they believe whatever the filmmakers are espousing. Listen, there’s no way a 70-foot shark could ever make it as close to shore as this one does without beaching itself. But it’s a better experience if you just roll with the outlandish stuff. 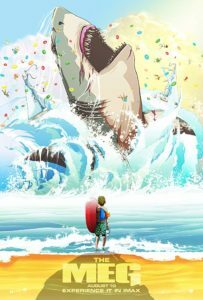 It makes seeing the “God’s Eye” shot of the Meg picking off tourists in colorful inner-tubes looking like Fruit Loops in a cereal bowl far more wickedly delicious. In the pill-shaped glass diving cage sequence, the audience will be clued into how the plan will inevitably fall apart (a la FINAL DESTINATION), but the filmmakers make it a joy to see it all come together. And, of course, there are some solid scares with the shark. On the whole, Turteltaub’s film is perfectly paced. It moves like a shark closing in on its prey – efficiently and quickly. There’s a very subtle ecological message underlying the ridiculously enjoyable shenanigans that doesn’t bog down the narrative in the least. This is a classic creature feature showing nature taking revenge on harmful, greedy, stupid humans. Though they do build in dramatic stakes for characters you care to see live or die, audiences will find themselves at times rooting for the shark. Plus, the nods to FINDING DORY and JAWS are much appreciated – as is the cheeky end title card. THE MEG opens on August 10.